This is a hodgepodge of painted walls in India, where I have been travelling for the past five weeks. All of these are in South India (Karnataka, Maharashtra and Goa). 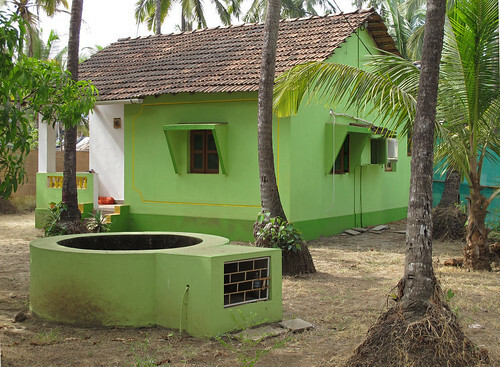 The buildings are generally made of laterite stone sealed with cement (see previous post). While all of these colours might not work in North America, we could use colour far better at home. When I saw this painted favela in Brazil I went through this sequence: 1. Wow, beautiful. 2. How is papering over poverty and structural inequity with a rainbow going to help? 3. I would actually feel much happier living in Santa Marta after the paint job, and maybe it would attract money into the community. Folding bar by my friend (and well known Toronto designer) Barr Gilmore. Available from made design. Via moco loco. The Colour Barr is made of stainless steel, polyurethane enamel, ziricote, glass decanters, tumblers, shot glasses, cocktail shakers and various bar equipment. The point is to move you away from the computer/TV screen and toward socializing. IKEA boxes, some with interiors painted, assembled via art clips. Very clever. Via doorsixteen (and the rest of her post contains good material too). You could of course build a larger and more permanent structure, with glue and/or screws. 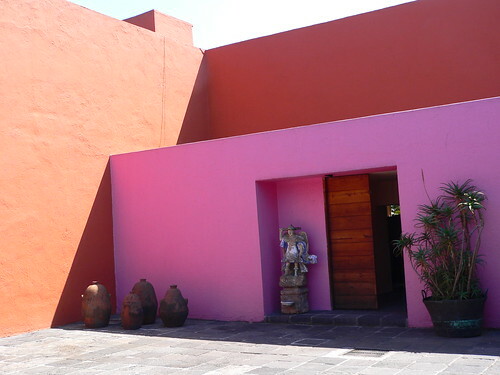 These photos of architect Luis Barragán’s Casa Eduardo Prieto Lopez were taken by pov_steve on Flickr. The house was built in 1950 and is part of the Jardines del Pedregal neighbourhood designed by Barragán for a lava-covered site in Mexico City. This is effectively a subdivision; why do the two countries north of Mexico do this so much more badly? Paper cutout sculptures by Jen Stark. Thanks to Paul for pointing these out. It seems paradoxical that geometry can create a visceral response, but it does.